Deepening the historical consciousness is part of the formative journey. Updating it regularly is equally imperative and shows one’s commitment. This makes a person relevant in the present and enables him to contribute in the future. 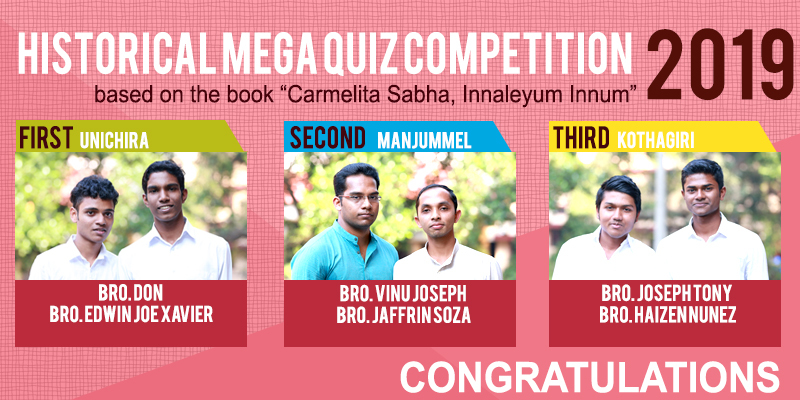 That is what happened today (12 January 2019) at Jyotir Bhavan, Kalamassery where our students from various formation houses gathered together for the Historical Mega Quiz Competition based on the book Carmelita Sabha, Innaleyum Innum, written by late Rev. Fr. John Pallath OCD. Six teams participated in the event wholeheartedly in the presence of their masters and directors. The students from Unichira Bro. Don and Bro. Edwin Joe Xavier won the first prize. The theology students Bro. Vinu Joseph and Bro. Jaffrin Soza secured the second prize and the third prize goes to Bro. Joseph Tony and Bro. Haizen Nunez from Kothagiri. Congratulations to all of them!! !